Our bodies radiate far infrared energy through the skin at 3 to 50 microns, with most output at 9.4 microns. Graphene'far infrared rays' have a wavelength 6~19 microns, quite close to the human body. Far Infrared Ray are waves of energy, which positively help activating body systems and functions. + Safety: Innovative graphene heating film and DC12V output power adpter, less possibility of burning or electric shock. 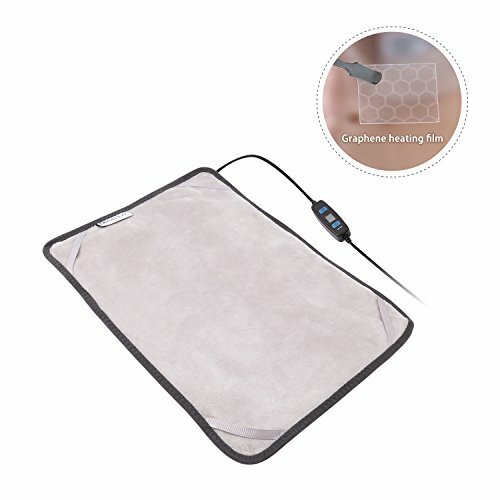 + 12'' x 15'' Medium Size Heating Pad: A perfect solution for arthritic pain, cramps, body aches, sore muscles, back, legs, arms and more. Also, it's a perfect choice for your pets dogs cats. + 3 Temperature Settings: Easy 3 temperature settings to accommodate your comfort level. + 1 Hour Auto Shut-Off: Conserves energy and prevents burns caused by excessive heating. Medium size: 12" x 15" heating pad, perfect for your back, shoulders, legs, arms, or anyhwere you want. Also, it's a perfect choice for your pets dogs cats. Safety: Innovative graphene heating film and DC12V output, there is no way that it can burn you or suffer electric shock, which is definitely safer than the traditional electric pads(AC110V ). View More In Heating Pads. If you have any questions about this product by BriGenius, contact us by completing and submitting the form below. If you are looking for a specif part number, please include it with your message.